"A Good House and Apartments for the Indian Master and His Scholars"
The second oldest building at William & Mary is the Brafferton, constructed southeast of the Wren Building to house William & Mary's Indian School. The royal charter of 1693 that established W&M stated as one of its goals "that the Christian faith may be propagated amongst the Western Indians, to the glory of Almighty God...." Over thirty years later, William & Mary Statutes reaffirmed the mission to "teach the Indian boys to read, and write, and vulgar Arithmetick.... to teach them thoroughly the Catechism and the Principles of the Christian Religion." Funds from the estate of Robert Boyle, the famous English scientist, were used to endow the Indian School. Boyle's will provided that £4,000 sterling should be employed for "pious and charitable uses." Boyle's executors decided to use the funds to purchase Brafferton Manor in Yorkshire, England, part of the annual income from which supported the Indian School at William & Mary. In the beginning, classes were held in temporary quarters and later in the Wren Building; the boys lived with families in town until the Brafferton was constructed in 1723. Although the name of the builder is not recorded, it is likely that Henry Cary, Jr., who built the President's House and the chapel wing of the Wren Building a decade later, was responsible. Described by Hugh Jones in The Present State of Virginia in 1724 as "a good House and Apartments for the Indian Master and his Scholars," the Brafferton has two main floors divided by a wide center hall to the west of which there is a single large room and to the east of which are located two smaller rooms. The large room on the first floor was probably used as a classroom, with the two smaller rooms providing an apartment for the Indian Master. The young scholars would have slept in dormitories on the second floor, taking their meals with the rest of William & Mary in the great hall of the Wren Building. Some years after the construction of the building, dormers were added to the roof, making the attic habitable. At the time of the American Revolution, William & Mary lost the income from the Boyle estate, and the Indian School was discontinued. Since then, the Brafferton has been used for a multitude of purposes, serving at various times as a dining hall, faculty residence, dormitory and classroom building. In the 1950s and '60s, the Brafferton provided office space for the Alumni Society and guest rooms for visitors to the university. The only one of the university's three colonial buildings to have escaped the ravages of fire, the Brafferton nonetheless suffered an almost complete loss of its interior during the Civil War, when the doors and much of the flooring were removed and used for firewood. The window frames and sash are said to have been removed and used in quarters for the Union officers at Fort Magruder. The exterior brick walls of the Brafferton are, however, the most substantially original of the university's three colonial buildings. 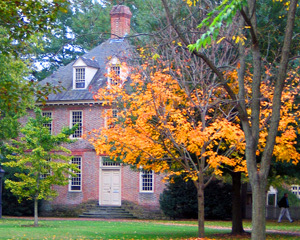 The exterior was restored to its colonial appearance in 1932 as part of the Rockefeller Restoration of Williamsburg, and today the Brafferton houses the offices of the president and provost of the university.